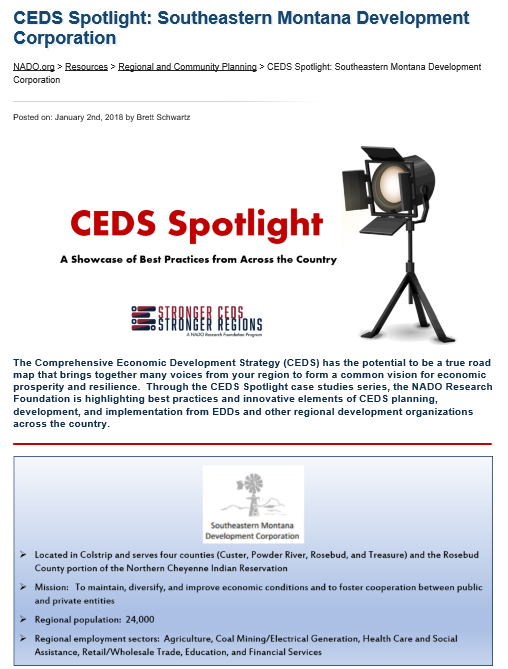 These documents are a summary of the 2018 Comprehensive Economic Development Strategy (CEDS) community and growth policy meetings. These meetings were designed to obtain community feedback and input as to what the current state of each community is, how things have changed from last year, and what projects are priorities to be completed for the following year(s). Below are the recaps from each community we visited in the four counties of Treasure, Rosebud, Custer and Powder River. These CEDS recaps will dovetail with the updates of the growth policies for the City of Colstrip, Powder River, and Rosebud County. The updated growth policies are an important tool for helping our communities manage change and to help maintain our way of life. Attendees had the chance to provide public comment on these important planning documents to help all of us take advantage of economic opportunities and to address community issues that we will face in the future. Please click on the following communities to view/download the 2018 CEDS Community Meeting Recaps in PDF format. 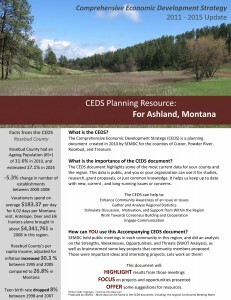 These documents are a summary of the 2017 CEDS community meetings. These meetings were designed to obtain community feedback and input as to what the current state of each community is, how things have changed from last year, and what projects are priorities to be completed for the following year(s). 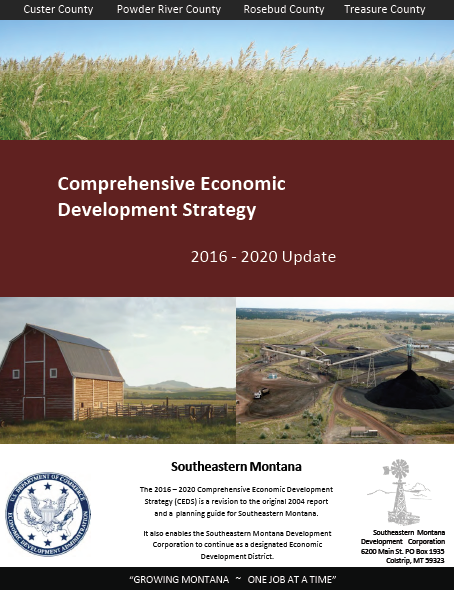 This year was the complete update of the Comprehensive Economic Development Strategy for the four counties of Treasure, Rosebud, Custer and Powder River counties. Below are the recaps from each community we visited in all four counties. Please click on the following communities to view/download the 2016/17 CEDS Community Meeting Summaries in PDF format. Our CEDS process was featured on the Best Practices section of the National Association of Deveopment Organizations website. Click Here to see that information. 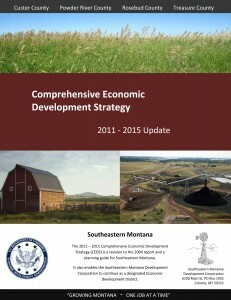 The 2011-2015 update of our CEDS is the result of a thoughtful and often challenging planning and implementation process designed to improve the economy and quality of life in Southeastern Montana. This ongoing process involves gathering input from a culturally and economically diverse group that includes individuals and organizations from the SEMDC Economic Development District (EDD). We continually analyze local conditions, identify the strengths, weaknesses, problems, opportunities, and design strategies to achieve objectives, coordinate activities to implement the strategies, and evaluate accomplishments. Without the active involvement of local elected officials, area business people, government employees, school officials and private citizens, this update would not have been possible. We have created local ‘working documents’ to accompany the CEDS document in order to highlight the various strengths, weaknesses, opportunties, threatsm, and proposed projects that were brainstormed at the community meetings. View the 2011-2015 CEDS Planning Resources: Ashland, Broadus, Colstrip, Forsyth, Hysham, Lame Deer, and Miles City.